Perhaps 5,000 people died in Puerto Rico in 2017 for reasons related to September's Hurricane Maria, according to a study that dismisses the official death toll of 64 as "a substantial underestimate." A research team led by scientists at the Harvard T.H. Chan School of Public Health didn't simply attempt to count dead bodies in the wake of the powerful storm. Instead, they surveyed randomly chosen households and asked the occupants about their experiences. From that approach, they concluded that between Sept. 20 and Dec. 31, 2017, there were 4,645 "excess deaths" — that is, deaths that would not have occurred if the island hadn't been plunged into a prolonged disaster following the devastating storm. But the estimate isn't as precise as the figure implies.The researchers calculate a statistical term called a 95 percent confidence interval, which encompasses a broad range – from 800 to 8,500 deaths. Their figure of 4,645 lies near the middle of that range, and they round up to something over 5,000 to account for some assumptions they made. The findings were published Tuesday by The New England Journal of Medicine. The research team randomly selected 3,299 households in Puerto Rico. Local scientists surveyed them over the course of three weeks in January. People in those homes reported a total of 38 deaths. The scientists then extrapolated that finding to the island's total population of 3.4 million people to estimate the number of deaths. 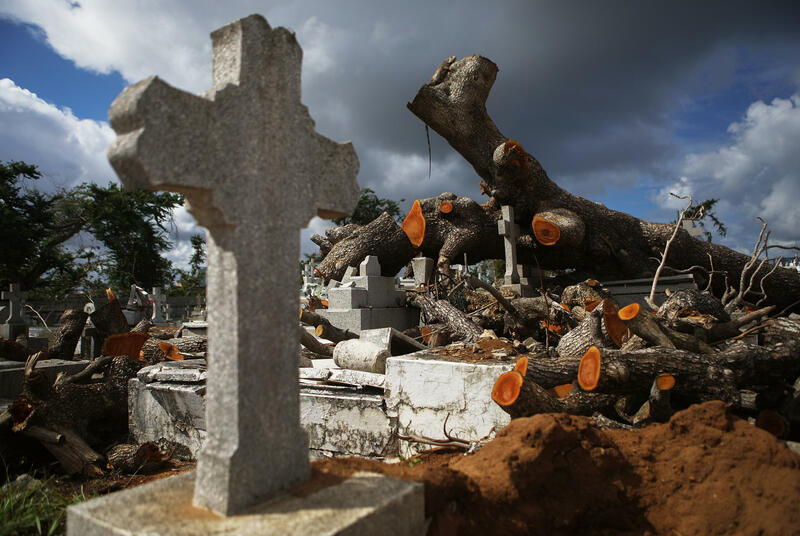 The researchers then subtracted deaths recorded during that same period in 2016 and concluded that the mortality rate in Puerto Rico had jumped 62 percent in the three months following the storm. The death rate is a contentious subject, in part because federal and island governments haven't responded as rapidly to the disaster as they have in other hurricane emergencies. The study notes that 83 percent of the households in Puerto Rico were without electrical power for the time period looked at, more than 100 days, from the date of the hurricane until the end of 2017. The government of Puerto Rico commissioned researchers from George Washington University's Milken Institute School of Public Health to estimate excess deaths. Results of that study have been delayed and are due out this summer. "We have always expected the number to be higher than what was previously reported," said Carlos Mercader, executive director of the Puerto Rico Federal Affairs Administration. He says that's why it commissioned the study from GW. "Both studies will help us better prepare for future natural disasters and prevent lives from being lost." Caroline Buckee, a lead author of the news and epidemiologist at the Harvard T.H. Chan School of Public Health, says, "Our approach is complementary to that and it provides a different kind of estimate and a different kind of insight into the impact of the hurricane." The researchers suggested that the government in Puerto Rico could use its methods in an even larger survey to reduce the large uncertainties in their findings. The Harvard study covers a greater time period than The New York Times' calculation, a difference that could partly account for the much higher figure. The household survey is a widely accepted technique for estimating casualties following a disaster. But it can be misleading if the sample isn't truly random or if some households have been wiped out altogether and are therefore missing from the survey. In the latter, the result would underestimate the true toll. In fact, the Harvard team says its results are "likely to be an underestimate" because of this bias. The survey looked at deaths through the end of 2017, but the scientists suspect that the excess deaths continued into this year. "We saw consistent, high rates, in September, October, November, December," says Rafael Irizarry, a biostatistician on the research team. "There's no reason to think that on Jan. 1 this trend stops." "Hurricane Maria caused massive infrastructural damage to Puerto Rico," the Harvard team writes in its study. "In our survey, interruption of medical care was the primary cause of sustained high mortality rates in the months following the hurricane," the wrote. Hospitals and doctors struggled to provide care, and many people simply had trouble getting to the doctor or the hospital to seek medical care. The survey finds that one-third of the total deaths in the months following the storm were caused by delayed or interrupted health care. Understanding the true number is important for many reasons. "There are ramifications not only for families, not only for closure, but also financial ramifications" such as for aid and preparedness, says Dr. Satchit Balsari, one of the lead investigators, who is a physician at the Harvard FXB Center for Health and Human Rights. We have a sense today for how deadly Hurricane Maria's impact on Puerto Rico truly was. A new study estimates the number of dead could be around 5,000, which is much higher than the official figure, which was 64. In a moment, we'll hear reaction to the new estimate from San Juan, Puerto Rico. But first, NPR's Richard Harris says the study highlights the long-lingering effects of the storm. RICHARD HARRIS, BYLINE: The new figure is based on a door-to-door survey of about 3,300 randomly selected households conducted in January. The researchers tallied the reported number of deaths, calculated a death rate and compared that with the death rate from the previous year. The result is a number somewhere between 800 and 8,500 excess deaths with 5,000 being a central figure. Caroline Buckee at the Harvard T. H. Chan School of Public Health is a lead author of the study. CAROLINE BUCKEE: You know, one of the attractive elements of this type of approach is that it's quick and easy and very cost-effective. HARRIS: She says it complements the official method, which usually relies on medical examiners who view bodies and determine the cause of death. That catches drownings, tree falls and other obvious storm-related deaths. The survey approach digs deeper and includes lingering causes. Satchit Balsari, an emergency physician and the other lead author, says surveys give a glimpse of the other causes. SATCHIT BALSARI: There were a range of reasons offered that included just inability to prepare their medicines. HARRIS: Vital medical equipment that required electricity also failed. Some people said they couldn't call 911. BALSARI: Or they were unable to reach the health care facilities because roads were damaged or the facilities were closed or the doctors were unavailable. HARRIS: The results are published online by the New England Journal of Medicine. One drawback of this study is it suggests a huge range, not a concrete number. RAFAEL IRIZARRY: The reason there is a large uncertainty around that number is because that's a rare event. HARRIS: Rafael Irizarry is a statistician at Harvard and a co-author of the study. The survey identified 38 deaths after the storm in its sample of 3,300 households. If by chance they had found half a dozen more or fewer, that would change the bottom line substantially. That said, the new statistics are broadly consistent with research based on death records by The New York Times in a recent academic study, Irizarry notes. IRIZARRY: We have four estimates, and the current government count is the one that is an outlier in terms of being very low. HARRIS: That's the one that shows 64 deaths. Alexis Santos, a demographer at Penn State University, conducted the previous scientific study and published his results online in November. He found about a thousand deaths for September and October. That's a shorter time period than covered in the Harvard study, which ran through December. He says the Puerto Rican government reacted to his findings by blocking access to government health data. ALEXIS SANTOS: Under normal circumstances, I could have been given preliminary data already for death counts in 2017. That is not the case. Right now, they are just saying they're not going to share the information with anybody. HARRIS: So for now it's a waiting game. Puerto Rico funded a study by researchers at the George Washington University. That is running far behind schedule and may now produce results this summer. Richard Harris, NPR News. Transcript provided by NPR, Copyright NPR.